An everyday miracle. Naturally. But look a little closer still, and there is even more going on. When you look at your children enjoying the school playground, climbing the slide, bouncing on the spring rider, swinging on the swings, what do you see? A joyful childhood moment? Absolutely. Carefree fun? Of course. An everyday miracle. Naturally. But look a little closer still, and there is even more going on. The wonder of a good school playground is just how much they can continue to contribute towards a school’s educational mission. A deeper examination of all of our playground staples reveals a wealth of developmental helps and growth assisting factors. Better understanding these can benefit your child’s own growth, as well as help you know what to look for when considering your child’s first school. Slides – Lifting their little bodies up and down the ladders of a slide can be hard work. Both arms and legs get excellent exercise on each and every go around on the slide. Alongside this practice comes the necessary skills linked to balance and hand-eye co-ordination necessary to keep limbs in line as the rhythm of foot falls and hand swings take on a new dimension. Slides also offer a wonderful lesson in delayed gratification, perseverance, and the natural balance of effort and reward. All essential understandings for early mental and social development. Roundabout – What better way for a child to explore the outermost limits of their balance and co-ordination skills than a roundabout. Dizziness and discombobulation might seem detrimental to a child’s development, but learning is often as much about knowing what you cannot do as what you can. In addition, the energy you need to be the child who spins the roundabout is often extraordinary, especially if several friends have come to join in. See-Saws – Core upper body strength gets an excellent boost when balancing atop the see-saw. Not to mention how much socialising and people-skill practice children benefit from in playing with a piece of playground equipment that simply will not work as intended without the intervention of a second party. Spring-Riders – Hand and grip strength are essential when trying to hold on to the cars, birds, dinosaurs, or any number of other whimsical steeds children find themselves mounting when sitting astride a spring rider. Because of how unsteady and sudden some of the movements can be, for many smaller children the decision to board a spring rider may be a challenge that involves facing some fears. Yet once they get into the swing of things, their bodies begin processing all kinds of information about momentum, balance, and movement in space. Monkey Bars – Where balance and hand-eye co-ordination might had been useful skills that get slowly boosted while playing on toys previously mentioned, on the monkey bars they are an absolute essential. Coupled with the required upper body strength and agility, monkey bars may perhaps move from being a child’s toy to an actual challenge. One that requires perseverance, practice, and patience. 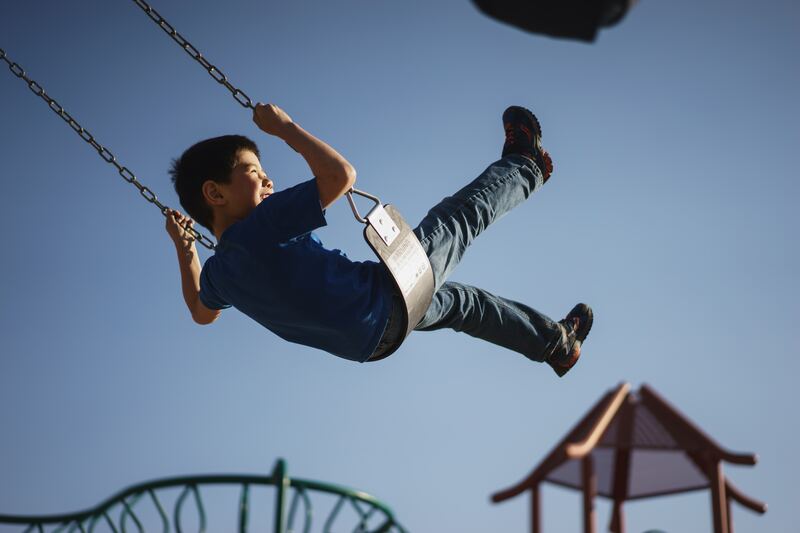 Swings – The benefits of swings can be felt even by those as young as one or two. The new sensory experiences they receive as they feel the rush of wind, and the world shift in orientation around them as they move is all vital extra information they can use to formulate the fullest possible picture of the world. As children grow, they can discover all kinds of vital principles of motion and fine motor skills to keep their swing session going, as well as growing the strength of their grip, their balance and their overall poise as they climb onto and jump down off from the swing seats. Climbing Frame – There is no better way for a child to develop a sense of overall body co-ordination than a lengthy and energetic session on a climbing frame. The grip skills necessary to scale a rock wall or an intricately interlaced geometric network of ropes range from hand to finger to foot to toe. The co-ordination requires all four limbs to work in perfect unison. Reaching the very top will doubtless bring a confidence boost possibly only rivalled by a touchdown/goal/three point basket. Very well deserved too, given the mental focus and patience required to succeed. Next time your children run wild in the playground for longer than maybe you might normally like, remember to look very closely at every structure and every style choice at work in the equipment. This is all very deliberate, with a very clear goal in mind. A play session that delivers development, as much as it furnishes fun.